There is no single solution to breaking the cycle of poverty. It is a multi-faceted and collaborative endeavor, and it is one we are taking on in concert with hundreds of people, agencies and organizations across southwest Washington. Will you join in our charge? Southwest Washington is growing again. There are new industries budding and professional jobs are on the upswing. Our cities are full of energy and excitement. Many signs are pointing to a full recovery from the economic downturn. Still, many of our neighbors are not experiencing the same gains. Poverty trends have been slow to reflect broader economic gains, and in some cases they are getting worse because of increasing social inequities and the cyclical nature of intergenerational poverty. From 2000 to 2013, our region saw a 24 percent population increase. During that same time frame, poverty increased by 59 percent. That is nearly 27,000 more people living in poverty. When you zero in on childhood poverty, the numbers are even more pronounced. Though there has been some recovery, there were nearly 4,000 more children living in poverty in 2014 than we had in 2007. In fact, children represent nearly one-third of those who are living in poverty across Clark, Cowlitz and Skamania Counties. Due to the unaddressed effects of adversity in their lives, many low-income children in Washington enter school with lower cognitive, social-emotional, and language skills than other children. According to the Kids Count Data Center, more than half of our children in southwest Washington are unprepared in some when they enter school, and why our graduation rates are still under the national average. Poverty is taking hold of our region at the roots—disproportionately affecting our children. And almost every one of these indicators becomes worse when you narrow in on our region’s growing communities of color. The fact is that people are living on tight margins, and these economic realities are painfully visible at local shelters, hospitals, food banks and schools. This is why the Community Foundation focused its sights on interrupting the the cycle of intergenerational poverty in 2012. We wanted to ask tough questions, take risks and pursue big solutions. We want to create a more resilient community where everyone has a voice and the opportunity to live up to their full potential. What does this look like? See for yourself. It’s time to end the finger pointing and start a new narrative. Do I accept that more of my neighbors are falling into poverty, and that many of them have families with young students? Do I accept that a housing emergency is displacing our young people, elderly and disabled? The Community Foundation does not accept this state of affairs. We want to read a different story with a growing cast of characters that are working collectively to address these social ills. Where do you see your role? Contribute to our charge against poverty. The Community Foundation is leveraging the best research and data from the field to bolster local approaches to intergenerational poverty. 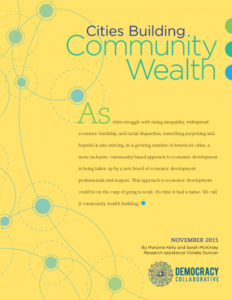 Below are a number of resources that we believe to outline clear strategies and best practices for communities to create sustainable economic change. The nation is facing an escalating housing crisis. Skyrocketing rents and inadequate infrastructure are some of the barriers that are preventing millions of working Americans from reaching their full potential. 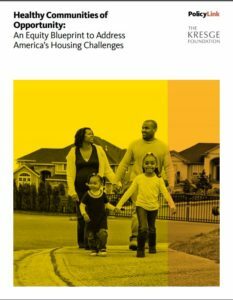 This PolicyLink report outlines a case for progressive, equity-focused policy. Democracy Collaborative shares new tools and systems for economic development where civic leaders, businesses, anchor institutions, cooperatives and community organizations are collaborating. What’s emerging is a systems approach to creating an inclusive, sustainable economy where all can thrive. 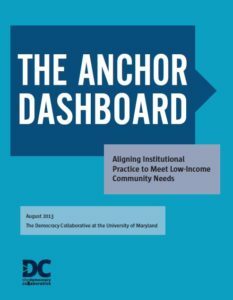 This study from the Annie E. Casey Foundation seeks to introduce a framework that can assist anchor institutions, such as Community Foundations, in understanding their impact on the community and, in particular, their impact on the welfare of low-income children and families in those communities.